Cesar Zamora, DDS always appreciates feedback from our valued patients. To date, we’re thrilled to have collected 29 reviews with an average rating of 4.93 out of 5 stars. 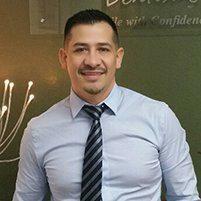 Please read what others are saying about Cesar Zamora, DDS below, and as always, we would love to collect your feedback. My experience with the doctor was very satisfactory. Dr Zamora (and his staff) is the most attentive, friendly, and knowledgeable dental practice I have ever gone to in my six-decades of life( and,I come from a medical/dental family!) Dr. Zamora's practice is also very affordable. The hygienic cleaning are the most gentle and thorough I have ever had also. I highly recommend Dr. Zamora and staff!!! Estupendo servicio!! La atención, la rapidez , la amabilidad del doctor y personal!! Con gusto regresare otra vez !! Both Cesar and his team were great!